Whether you are the one throwing the holiday bash or just an honored guest, there is no better way to express holiday cheer (well, there are always food and drink, I guess) than using beautiful and dramatic plants to decorate indoors and out. Traditional favorites are chrysanthemums, in all their glorious fall colors; miniature conifers, for that wintery, Christmas-y feel; or poinsettias, gigantic and bright splashes of color that last and last through the season. Here are a few more suggestions of plants to lend a festive air and ways to use them through the coming merry months. I’m not suggesting that you not use any of the aforementioned standards. When decorating for your happy event, there are lots of ways to display them. Standing pots as sentinels at the entryway, massing them in the center of the food table, even wrapping small pots as placeholders and party favors at each dinner setting are tried and true holiday fare (I’m sure Martha Stewart has been telling you that for years). But why not branch out with a color theme or particular shape and see what might be possible? 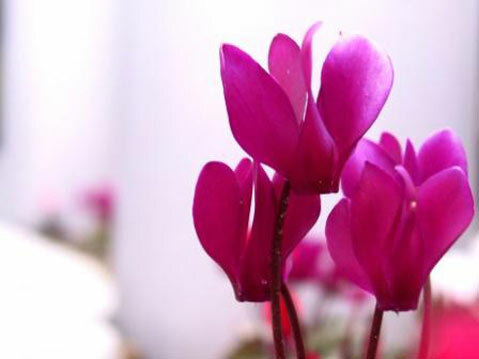 Fill a basket with cyclamen. They range in color from snowy white through pink, magenta and into deepest red. All have deep green leaves with faint silvery veining. Their stiffness gives them an elegance and formality that might be just right for that dressy holiday affair. Other white, red, and green color combinations occur in begonias, too. Common are the semperflorens-type begonias. Those are the diminutive ones often used in masses as bedding plants. Up close, say nestled in a ring-shaped wire frame, they become a delicate and shining wreath. Use one half of the larger size of living wreath frames. Line with sphagnum moss and transfer the small plants (four inches or less) to the interior of the frame. Place them closely so that their foliage appears to be an unbroken mass. Tuck more moss around them as needed to hide any soil. Weave a ribbon or two around the wreath or add a few candles and enjoy as a centerpiece. Be sure to soak the wreath well at least once a week in a large sink or tub. A new favorite is Iresine. The deep red-leaved varieties are sometimes called blood leaf plant and are stunning in combination with other greenery. Truly outstanding is Iresine lindenii ‘Formosa.’ Each plant has the holiday spirit built in. Bright stems in deep rose red hold heavily variegated white and green leaves. Almost as showy as a poinsettia, these can be displayed in much the same way by caching their growing pots in something festive-a brass or silver bucket, glossy glazed pot, or even wrapped in richly patterned holiday gift paper. Conifer is just the common moniker for any number of needle-leaved, evergreen gymnosperms. The name actually refers to the reproductive structures known as cones that they bear, but the word “cone” also conjures “conical,” and many of these cone-bearing plants known as conifers are also somewhat cone-shaped themselves. Somehow, this rounded shape has become symbolic of the winter and holiday season. The pagan rituals that preceded our modern versions probably used evergreens as the reminder that life continued even through the cold and dark northern European winter. There are other evergreen plants that can be trained into the iconic cone. One popular choice is the savory and aromatic herb rosemary. This woody plant can be pruned in a fairly short time to resemble a miniature Christmas tree. A few glittery ornaments or even fresh flowers in floral water tubes, tucked into the foliage, will liven it up for that special party or dinner. Other choices include some of the finer-textured woody plants like cotoneaster-if pruned carefully and in a timely fashion, its tiny flowers will yield decorative red berries just in time for the holidays, too. Boxwood (Buxus microphylla) and dwarf eugenia (Syzygium paniculatum) make good subjects, as well. Vines like ivy and wire vine (Muehlenbeckia complexa) can be trained on wire forms to any shape, including cones and wreaths. If you are not throwing the party, it is always agreeable to take the host or hostess a small thank you for the honor of the invitation. Take the suggestions above as a guide, and you will find the perfect gift.